Are your staff driving you crazy? You’re not alone. 75% of businesses have ongoing problems with managing their staff and keeping up with their employer obligations. In today's competitive employment market, it's getting harder and harder to attract and retain the right people for your business. There are also heaps of rules and red tape around managing poor employee performance and terminations. It doesn’t have to be this way! Have you subscribed to our news? 1. How to develop a hiring strategy to attract and retain the right people for your business. 2. Our top 3 secrets for effectively managing and engaging with staff to work with you to achieve your business goals. 3. How to manage poor performing staff and exit staff from your business in accordance with legal obligations. Ask us any questions you have in a safe environment. 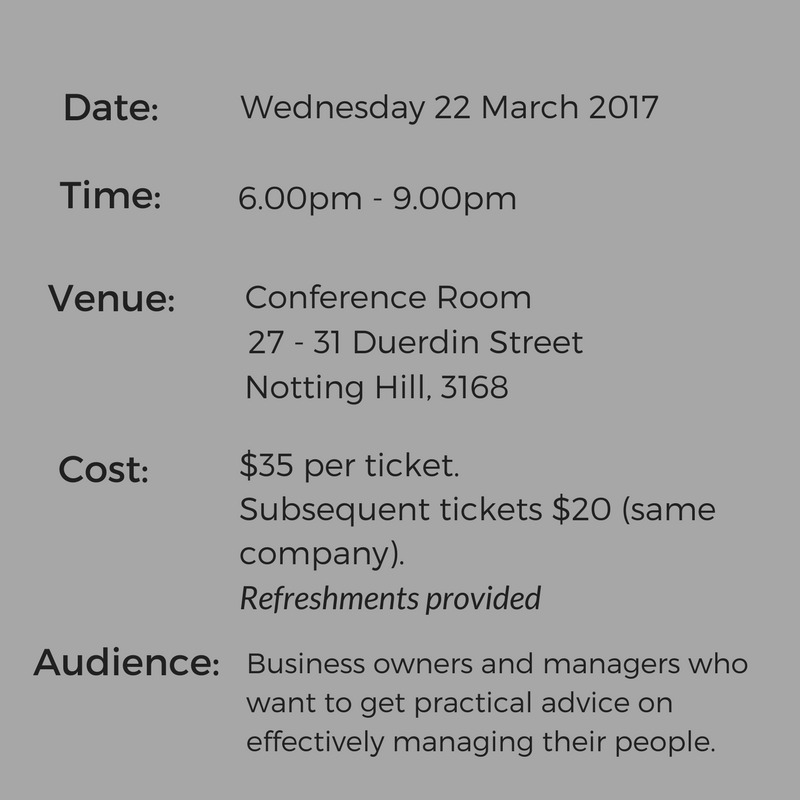 Grow your network and meet other businesses and managers attending the session. If you are purchasing more than one ticket please detail the full name and email address of extra ticket holders. Please notify HR Staff n’ Stuff at least two days prior to the session if unable to attend. A substitute is welcome. HR Staff n’ Stuff reserves the right to cancel any session or move to a larger venue if required. All registered participants will be notified immediately. In registering for this event, you are also providing permission to be photographed at the event and for your photograph to be used by HR Staff n’ Stuff. You understand and agree that if you wish to withdraw this authorisation, it will be your responsibility to inform HR Staff n’ Stuff.